Salam & hello everyone! Owh! I miss all of you! Sorry for being busy in this month. Bare with me! I have Final Year project, piled up of assignments, things to settle and wedding! I feel so guilty neglecting my blog. Sad me. Just a quick news, I have picked up all 13 winners for the recent giveaway. Winners will be reveal soon ok! 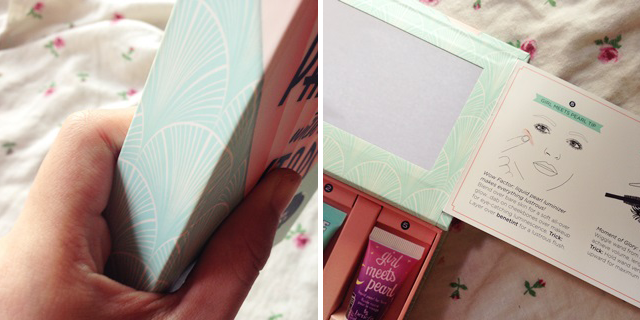 Now back to the review, today I am going to review this kit from Benefit Cosmetic that I got from my prize hamper in a recent contest I entered. This kit is a permanent collection. This kit was launch back in 2012. Benefit cosmetics is know for its quirky cute vintage looking stuff. For me it focus more to non-professional, by means non industrial makeup wear. Benefit always have the "express" type of makeup product. Tell me about it, I ma sold by all the packaging design. I think I wont trow it always even if I have finish using the product. They look just so cute on the table don't they! This is kinda like a primer for the eyes but it said it can be also be a primer for a concealer. It helps to make my eyeshadow stay and more pigmented. The applicator is like a small lip gloss applicator, pretty handy and the shade of this is quite light for a darker skin tone. But since its a primer, i think it would not be a problem because you are still going to cover it with eyeshadow. A lighter base makes an eyeshadow appears nicer right. The full size product now available in 2 shades, a lighter ones and a darker ones. One of the best seller from Benefit Cosmetics. Its a primer for the face, what is a primer? Primer basically going to help your makeup stay longer and nicer. I have a love and hate towards this product tho. I think I should test it more. It have a scent of a lemon if I am not mistaken. This deluxe can last you like a long time because you just need a small amount of it anyway. This is kinda like a cream foundation. The full size comes in 3 options of shades. The coverage is sheer to medium. I am expecting a full coverage actually. Its easy to blend but the downsize is the size of this product is small and its really hard to take the product, I kinda need to swrill over and over again to get it out. Maybe its a nice travel size touch up kinda stuff. The shade in this kit comes in medium, no you cant change the shade. This shade matches my skintone well, might not suit to fairer skin tone, but for darker, yes because its a sheer coverage, use a lil bit to give a nice sheer coverage. Another most rave stuff from Benefit. It is one of the earliest product I know from Benefit. Its a cheek and lip stain. It smells like a milk rosy-rose kinda stuff, quite okay. It is easy to use a a nice size for traveling. I think this will also last for like the longest time. Its not sticky so it feel nice to use on the cheek. Have you seen the ads video? Hilarious! Haha! At first I thought it was a face primer! Haha! Yep, I wear it on the whole of ma face! OBut it was okay tho! This is actually a highlighter. Use this on your face where you wanna highlight. i love this because it have a nice shimmer on it that does not look wear. We don't wanna look like Edward sunbathing on the sun right? It has a peach undertone that I think suits all skintone nicely. After the most raving the BADgal mascara that I love! This comes in to the market. This is an awesome mascara for lengthening and voluminous but not for curling. It makes my lash ticker but not in a clumpy ways. It does not hold my curl tho, but this is a real handy mascara! The size also gonna last you for 3 months perfectly! I recommend this kit to a beginner that are going into makeup and looking forward to Benefit Makeups. It help you like a introduction to Benefit Makeups products. Since I got it as a gift, I love it, but I would not buy it with my own money. I don't find that I need some samples in a box for a personal use, but I think theses kits are amazing for gist and to make your girl scream (notes to the boys). Price is RM20, an average of RM20 per samples. The mascara is available for purchase in sample size for RM38-40+ if I am not mistaken. For full list of price for all Benefit Cosmetics product click here , (link). Where To Buy : Benefit Cosmetics Counter, Sephora, participating outlets. This product(s) is obtain from a prize I won from a contest. Do you own any Benefit Makeup Kit or which Benefit Makeup Kit you would like to own? me too! haha! must resist them buttt... still hoping to get all of them kan! yet! ;) you will soon! Bought this. super love the Mascara, Girl Meets Pearl and Benetint. I am also not so keen on the Porefessional although everyone else swears by it. I just dont like the silky feeling on the skin. I dont have any raves towards POREfessional yet, but it was an okay product. After applying it, you skins feels more like a powdery feeling. Yep! Awesome for traveling too! I tried they're real mascara once and seriously lebat gila bulu mata! Balm as I have large pores! Sigh. Thanks so much for sharing! I didn't see this (or didn't notice!) during my visit to Sephora yesterday (excited to try the Naked3) so yeah, this should be an option for a makeup beginner like me. ok yg no.5 tu lawak hahaha!! Does the porefessional reduces the appearance of large pores?